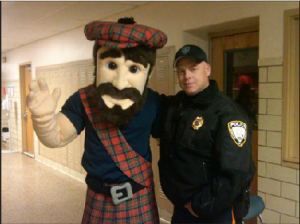 Big head bobbing and kilt a-flutter, Hank the Highlander made his debut in January at a New Jersey high school, the first mascot to grace the court in Governor Livingston High history. The much-anticipated mascot was purchased by the Highlander Booster Club after much careful research, some creative brainstorming, and some good old fashioned democracy. Booster Club executive board members, parents, teachers, students, and school administrators worked together to design the costume, and students voted on a name, choosing between Hunter, Hank, Harry, or Governor. Mascots can be a pretty serious investment, but with the right person inside the costume, the spirit they inspire can be well worth the cost. A mascot’s appearance is guaranteed to fire up fans and participants in all extracurriculars, from teams to clubs. And when the show’s over, their presence at fundraisers can inspire feelings of loyalty and encourage generosity in donors. If your students and supports lack school spirit, it could be time for a new mascot. Costumes ring up anywhere between $400 and $10,000, but most fall in the $1,500-$3,000 range. On the more affordable end you’ll find generic, pre-made costumes, your basic lions, tigers, and bears. Some choose to splurge for a custom-made costume of their own design, like Hank the Highlander, while others invest in a character professionally dreamed up just for them. On a budget? Buy a used costume on eBay, or task some crafty volunteers with customizing an affordable, generic costume. If you’re considering investing in a mascot, consider following in Gov. Livingston High’s footsteps and hold a vote. K-12 schools have found voting on a mascot to be a great teaching tool, giving educators an opportunity to explain democratic elections, or to teach their students about local wildlife. In New York, only native animals are eligible to vie for a four-year term as mascot for Pine Bush Elementary, while students at Hudson Maxim School in New Jersey are treated to science lessons on each of their candidates. For high schoolers, voting on a mascot can foster a personal connection between students and the extracurricular events the mascot supports. And for new schools, it presents an opportunity to begin a tradition of strong school spirit. Future Tomball Memorial High students in Texas got a chance to cast their votes during the school’s construction, establishing a student identity. They were Fighting Wildcats before the doors even opened. Hogtown Mascots, where the self-proclaimed “mascot nerds” at are happy to answer questions, provide photo and video updates during construction, and even recycle old costumes for trade-in credit. For boosters on a budget, there are numerous options for generic costumes to customize — try Boosters Best, or even Amazon.com. Have any tips for boosters looking to revamp their mascot? Know a great costume manufacturer? Share tips for getting the most from your mascot on Boosterland’s Facebook.